The rain stopped this morning, so I took advantage of the clearing skies and went out for my run. I had no plan except to cover more miles than I normally do on weekdays, when I'm constrained for time. I was feeling slightly sluggish on my first steps out the door -- I think it had more to do with the humidity than my physical condition. 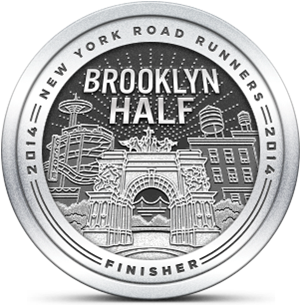 I ran easy for the most part, not minding my pace or even looking at my overall time. There were a few other runners out at the same time and I crossed paths with a young woman who appeared to be struggling with her workout. The weather was taking its toll on everyone. I completed my run feeling like I'd worked harder than my numbers showed. If it's more about perceived effort than actual pace then I did well today. After my run I went for my six month checkup at the dentist. 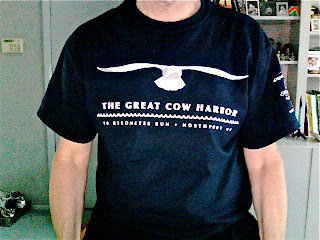 I was wearing my 2011 Cow Harbor t-shirt and my dentist (who is 8 months pregnant) joked that she'd skipped Cow Harbor this year because she'd gained too much weight. One of my daughter's teachers mentioned last week that he'd ran it on Saturday. I guess I shouldn't be surprised, around here, Cow Harbor is the race to run.